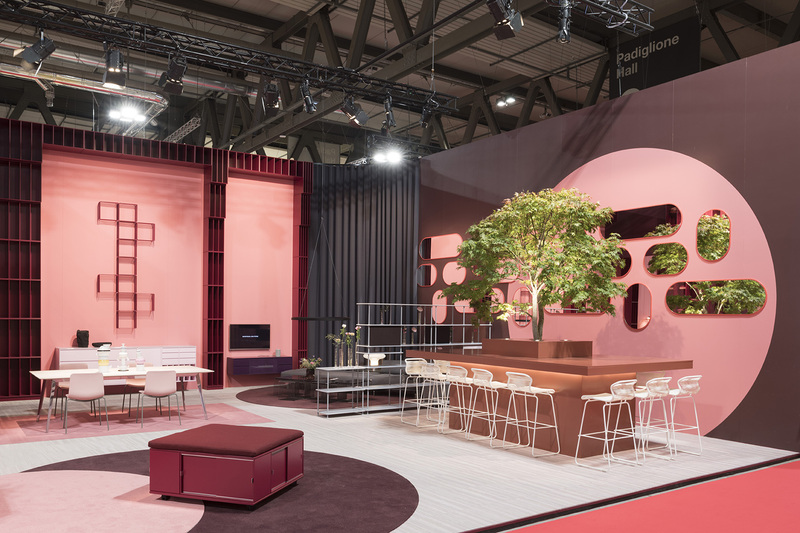 Danish furniture producer wins FRAME Award for Best Use of Color following Salone del Mobile 2018. Every year, the FRAME Awards Milan honours Salone del Mobile’s most inspiring and innovative exhibitions in the categories of Best Use of Color, Best Use of Light, Best Use of Material and Trade-Fair Stand of the Year. Montana’s Bolon-featured stand, designed by Helena Laursen, won in the category of Best Use of Color. Jury Member and cofounder Howard Sullivan, fell for Helena Laursen’s vivid color design for Montana. ‘We were instantly drawn in by the giant colour statement: a megalith of red shelving scaling all the way up the walls,’ says Sullivan. ‘We love how committed the design was, using only Montana’s modular furniture to create the entire scheme of reds from neon ketchup to pink to oxblood’. Montana’s winning design features Bolon’s flooring, Missoni; Flame Patch Pink.